Marjory Stoneman Douglas shooting suspect Nikolas Cruz is facing new charges after BSO officials say he attacked a detention deputy. Parkland school shooting suspect Nikolas Cruz is facing new charges after officials say he attacked a detention deputy inside the Broward County Jail, where he is awaiting trial for allegedly killing 17 people in February. According to an arrest report, Cruz struck the deputy in the face following a verbal disagreement before grabbing hold of the deputy's stun gun — which went off during the fight. The verbal disagreement started when the deputy told Cruz to stop dragging his sandals on the ground and Cruz gave him the middle finger, the report said. 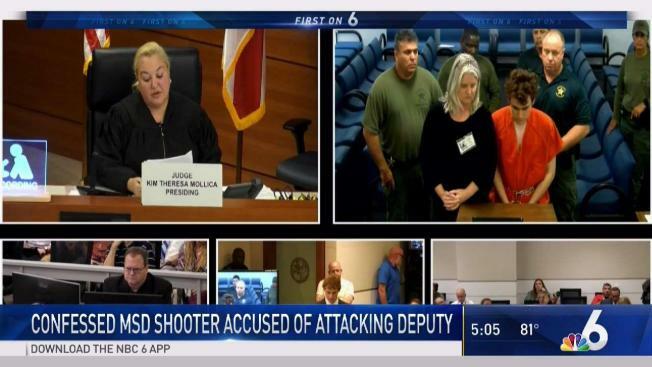 Surveillance video showed Cruz striking the deputy several more times, according to the report, before the deputy grabbed the stun gun back and hit Cruz with it. Cruz eventually got off the deputy and was placed under arrest. According to BSO jail records, Cruz faces three preliminary charges: aggravated assault on a correctional officer, battery on a law enforcement officer and use of a chemical or electrical weapon on an officer. All are felony charges. The charges are listed on the jail's website in addition to the 34 charges he faces for the shooting at Marjory Stoneman Douglas High School. BSO officials said the 41-year-old deputy involved in the incident has been with the department for 15 years. Cruz's attorneys had no immediate comment. Cruz made a brief court appearance Wednesday afternoon, where his attorneys were granted authorization to take photos of any injuries he may have. Another hearing was scheduled for Friday afternoon. Cruz has been held without bond since his arrest shortly after the shooting. Andrew Pollack, father of Parkland victim Meadow Pollack, spoke about the latest Cruz incident Wednesday. "They should've finished what he started, that's my opinion, if I was there working at the jail that's what would've happened," Pollack said. The incident comes at the same time as the MSD commission is meeting in Sunrise, with Broward schools superintendent Robert Runcie, Sheriff Scott Israel and Scot Peterson — the school resource officer who has been criticized for his response during the shooting — scheduled to speak. On Feb. 14, Cruz allegedly entered Marjory Stoneman Douglas, where he was once a student, and opened fire, killing 14 students and three staff members before being arrested shortly after. He's pleaded not guilty in the shooting but his lawyers say he would plead guilty in exchange for a life prison sentence.